Forward Health, the U.K. startup that has built an app to help healthcare professionals communicate in a secure and compliant way, has picked up $3.9 million in seed funding. Leading the round is Stride.VC, the new VC fund from Fred Destin, formerly a Partner at Accel, and Harry Stebbings, producer of the “The Twenty Minute VC” and most recently Entrepreneur-in-Residence at VC firm Atomico. Additional backing comes from Albion Capital, while Forward already boasts a decent array of angel investors. They include health tech founders Jay Desai from U.S. company Patient Ping, and Melissa Morris from U.K.-based Lantum. 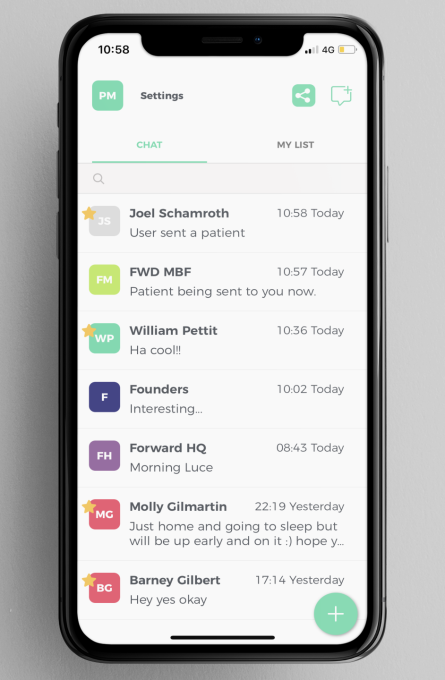 Founded in 2016 by U.K. doctors Barney Gilbert and Lydia Yarlott, with serial entrepreneur Philip Mundy (who previously founded Goodlord), Forward Health is a messaging app and broader communications platform designed for healthcare professionals, particularly those working in hospitals. One overly simple way to think of it is as a “WhatsApp for doctors,” helping to wean healthcare professionals off of using the popular messaging app professionally, which is entirely unsuited for a regulated industry like healthcare. However, the bigger vision is to “connect healthcare systems around the world” by improving clinician-to-clinician (and potentially clinician-to-patient) communication and information-sharing with a platform that is built from the get-go to be secure, flexible and compliant. “Healthcare communication is incredibly fragmented,” Forward Healthcare’s Mundy tells me. “This has a direct impact on how well clinicians can do their jobs and the level of care patients receive. Currently, doctors and nurses working within the NHS have to rely on an outdated and inefficient combination of pagers, landlines, switchboards and fax machines to contact each other. This 1960s infrastructure wastes huge amounts of time and can lead to critical delays in information flow”. It is in this context that clinicians have resorted to alternative methods of communication, such as WhatsApp, which Mundy rightfully says are not fit for purpose and pose real risks. “Any communication of this kind needs to support the exchange of highly sensitive patient information, any app used needs to be NHS digital compliant, GDPR compliant and operate within the highest levels of data security,” he explains. “WhatsApp and others don’t do this, meaning individual doctors could be liable should patient data be sent to the wrong contact or thread. Additionally, an app such as Forward is designed by and for doctors, meaning it can perform in just the right way”. In Forward’s case, that means offering an in-app directory of healthcare professionals who work within the same hospital so that it is possible to message colleagues even if you don’t know their number, “safe exchange of information and images”, the ability to create task lists, and a way of ensuring everyone involved with a patient’s care “is on the same page and working from the same information”. The latter includes the ability for clinicians to share patient cards, akin to a mini electronic health record, on a need-to-know basis. To that end, the Forward app is GDPR compliant, NHS IG Toolkit Certified, and meets the GMC’s confidentiality guidelines. Clinicians must have an approved NHS or Trust email address to log into the app. Over the last year it has been piloted with a community of 5,000 doctors across five partner hospitals. In a call with Harry Stebbings — who led the round on behalf of Stride and whom I promised not to refer to as a podcaster-turned-VC (sorry, Harry, I’m a terrible person!) — he told me that Forward Health’s mission resonated with him personally due to his first-hand experience of how doctors communicate and share information in the NHS. It is quite well-known that Stebbings’ mother has MS, while more recently his father suffered a heart attack. “I knew healthcare communication was broken when, post my father’s heart attack, they faxed his ECG scans,” he says, aghast. When he was introduced to the Forward Health team, Stebbings says he already understood the problem. But, more so, he looks for founder-market fit and believes the Forward founders are extremely well-placed to solve this particular problem, with the right mixture of healthcare and product backgrounds. He says that another thing that has impressed him is the bottom-up growth that the Forward app has garnered, which we both agree is a little reminiscent to how business social network Yammer originally penetrated corporations. This sees healthcare professionals download the app and sign up using their NHS email address, without the need for a central diktat. They then typically encourage colleagues to do the same, which creates further network effects. This viral growth is also benefiting from the current career path of junior doctors, who, as part of their training, move from hospital to hospital and in turn spread use of the Forward app. Adds Mundy: “The last year has not only furthered our aims to help thousands of doctors and nurses avoid using pagers and WhatsApp, but it’s also shown us the scale of the clinical communication problem. It’s an issue at every level of healthcare, from A&E to community services, and affects all clinicians and every patient. With this capital, we’ll be able to work with even more clinicians across the UK to identify their challenges and expand our product to help solve them. We believe our current offering is just the start of what our platform is set to become”.